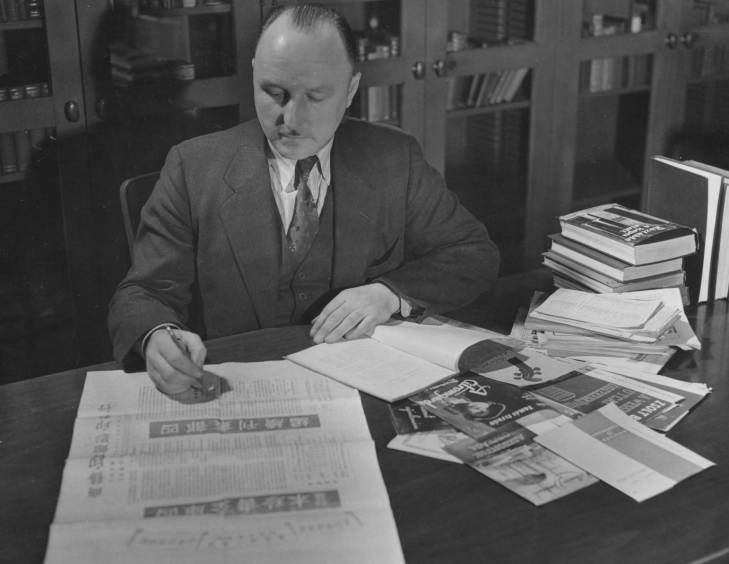 Part of the mission of Cleveland Public Library is to cultivate a global perspective for our patrons, and former Special Collections Librarian Francis E. Sommer (1890 – 1978) contributed his astoundingly broad knowledge of foreign languages to help enrich our foreign language catalog. Mr. Sommer was fluent in 14 languages, had a speaking knowledge of 22 more, and had a “personal acquaintance with” 45 in addition to that. During his career in the Special Collections Department of the Cleveland Public Library Mr. Sommer catalogued materials in 82 languages, a contribution that was invaluable to the library’s folklore collection. 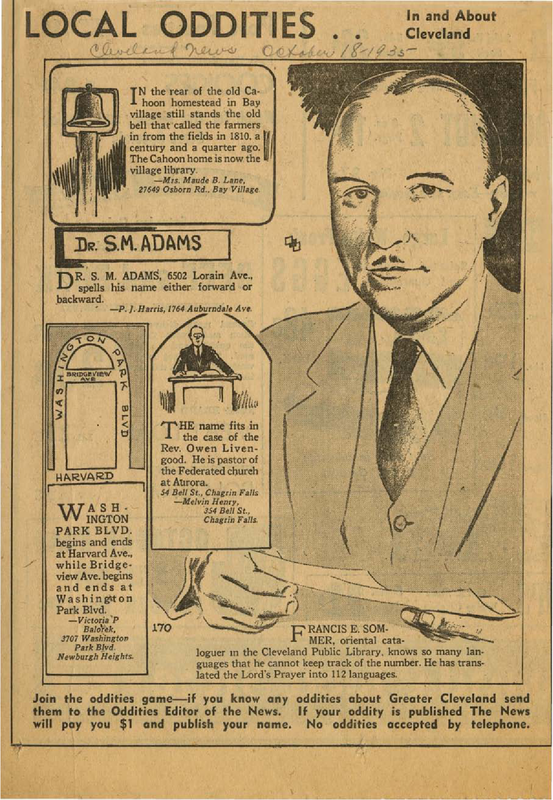 Mr. Sommer, however, led an interesting life long before his association with the Cleveland Public Library. Francis Sommer was born in 1890 in Germany, but moved to Belgium with his mother after his father’s death. Young Francis’ fascination with languages began with the study of Italian at the age of 9, and by the time he was 16 he picked up Persian, Turkish, Japanese, Arabic, and Hebrew, and during the course of his university education added Latin, French, English, German, and Russian, amongst others. In 1912, when Francis was 22, he accepted a job in Kharkov (in present day Ukraine), the first of many jobs he would hold in Russia. All of these seem to have called on his vast proficiency with foreign languages and translation, useful in managing international trade or diplomatic work. Sommer notes a distinct change for the worse in his travels during the year 1914, when Imperial Russia entered the First World War. His quality of life in Russia gradually diminished over the next few years as the stresses of the Great War brought difficulty on everybody and a heightened suspicion of foreigners. Late in 1918, hounded by police and shuttled in and out of prison on suspicion of espionage, Sommer decided that it was time to leave what had become Communist Russia. He packed what remained of his possessions into a suitcase, and road freight trains east through Siberia to the last holdout of the Imperial Russian forces in Vladivostok, on the Pacific Coast. There he stayed until the end on 1921, when he boarded a ship to Japan and left Russia behind for good. In 1954 Francis Sommer wrote a short book of his experiences in Russia called Idyll, War, and Revolution: Across Russia in Ten Historic Years, available in pdf on the Cleveland Public Library’s Digital Gallery. Francis Sommer’s contributions to Special Collection’s foreign language material endure. Please feel free to stop by the department any time to see works written in any language.